Terra Formars is a game by Nicolas Badoux, published by Japanime Games. It is for 2-4 players. 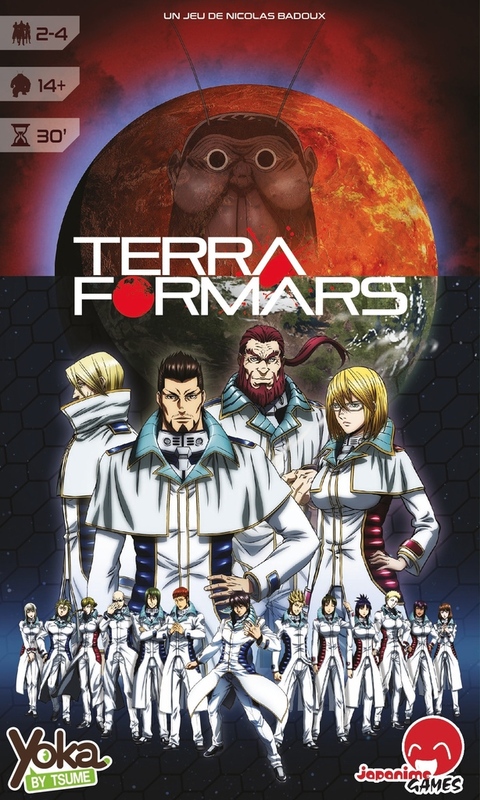 In this game based on the Terra Formars anime and manga series, players take on the role of a genetically modified warrior sent to Mars to eliminate the giant cockroaches that were originally sent to heat up Mars’ atmosphere to make it suitable for colonization. Players will need to kill as many cockroaches as possible. When the last cockroach dies, the player with the most victory points will be declared the winner. To begin, players choose a Hero card, taking the corresponding Hero Marker and 2 Support cards. These cards create the player’s starting hand. The remaining Support cards are shuffled together and placed face down in the middle of the play area. The top 3 cards of the deck are drawn and placed in a row next to the deck. The Cockroaches deck is shuffled together and placed face down below the Support cards. A number of cards are removed from the deck when playing with less than 4 players. A number of cards, equal to the number of players, are then drawn and placed in a row next to the deck. The Special Die, Victory Point tokens, Star tokens and Injury tokens are all placed near the play area within reach of all players. The first player is chosen. Beginning with the first player and continuing in turn order, each player will place their Hero Marker on an empty Cockroach card. The first player is given the 6 Combat dice. Play now begins. The game is played in turns. Beginning with the first player, each player will take a turn following 4 steps. On a player’s turn, they will start off by rolling the 6 Combat dice. Once the dice are rolled, the player is then able to use the symbols on the dice to pay for actions. The player can spend 3 serums to roll the special die. They can use serums and stars to activate their hero’s technique. This should not be confused with the player’s talent, which is able to be used for free once per turn. They can also use the stars and serums to acquire a support card by paying the card’s cost. A new card is drawn to replace any cards bought this way. There are 2 types of cards, equipment and squad. Equipment cards are placed beside the hero when acquired. They will constantly help the hero until destroyed. The squad cards are placed in the player’s hand and may be played at any time. Once resolved, the card is discarded. Injuries shown on the dice can be used to attack the cockroaches. The player can place as many injury counters on the cockroach as they have injuries showing on the dice. Once the injury counters are equal or greater than the cockroaches health, it’s destroyed. The player that inflicts the final injury follows a series of 4 steps. First the player takes the number of Victory Point counters shown on the cockroach card. They will then hand out any spoils provided by the cockroach to any other player that had a hero marker on the card. The player is able to distribute the spoils however they choose. The cockroach card is then removed and a new card is drawn to take it’s place. The player then moves their hero marker to a new cockroach followed by any other heroes that had a marker on that card in turn order. It should be noted that each cockroach has a talent just like the heroes do. It must be activated during the player’s turn if their marker is on it. Usually this only happens when a danger symbol is rolled. Once a symbol is spent on a die, it is locked and can not be re-rolled for any reason during that turn. Any symbols not used during the turn, are lost. Once the player finishes any actions or attacks, they must then pass the combat dice to the next player in turn order. The game continues until a dead cockroach can not be replaced from the deck. At this point, players add up their victory points and the one with the most is the winner. This game has some pretty nice looking components. First off there are plenty of thick cardboard tokens for the injury, star and victory points. These are quite nice and copy the same look as the symbols on the dice. Speaking of dice, there are 6 white dice and 1 green special die. These appear to be screen printed or something of that nature. I have a feeling that with repeated plays, the symbols may start to wear off. However that hasn’t happened yet. The hero markers are thick hexagonal plastic tokens with a creature design carved into it. I’m not exactly sure what some of these are supposed to be, so it’s a bit odd for me. The game comes with 4 originally but there is a promo set that adds an additional green token and a couple of extra cards. Speaking of cards, these are gorgeous. They each have a glossy finish and some amazing looking artwork. The iconography takes a bit of getting used to but thankfully there’s a really nice reference card in 6 different languages to help you remember what does what. Of course the best looking cards are those of the various crew members. I think some of the images of the other cards were taken from the anime which tends to be a bit dark and sometimes blurry. Even so, I think that for the most part everything looks good. Overall, I’m rather pleased with the design. As I mentioned earlier, the reference card is written in 6 different languages. That’s because the game includes 6 different rulebooks, each written in a different language. There’s English, French, German, Italian, Portuguese and Spanish. The book has plenty of pictures throughout. There’s even a full page example of gameplay that takes you through a player’s turn. Every phase and step of the game is explained quite well. I didn’t see anything that was difficult to understand in any way. Of course the best part of the rulebook is the 3 pages of card details. Each card is numbered and that number is referenced in the book with explanations of what each symbol means on the card. This is a HUGE help when playing the game, especially the first few play throughs. I quite like the design of the rules. I think they did a great job overall. Let me start off by saying that before this game, I knew absolutely nothing about Terra Formars. Once I realized it was based on an anime and manga series, I started reading the story online. Needless to say, I haven’t gotten very far. The story is rather dark and kind of weird. However the game is a little less dark, apart from some of the visuals on a few of the cards. To be honest, I kind of expected the game to be a bit more harsh with the cockroaches really doing some damage to you. Instead the game is more about you taking it to them and attacking them. I could have also seen this game going the way of being a co-op survival game with players winning or losing as a team. However neither of these were the case with this one, which might lead fans of the series to be a bit put off. Seeing as I only have a little knowledge of the source materials, it seemed fine to me. The overall game plays like a deck builder as you’ll be using different icons provided by the dice to add new cards to your hand. In other ways, it’s all about rolling those dice to attack those cockroaches and gain victory points. It’s also about positioning yourself in the right place to score those spoils from a defeated cockroach. As I mentioned earlier, the game takes a bit of getting used to with the symbols on the cards. Thankfully the rulebook is more than adequate at helping understand each card. I think fans of the series might enjoy it. For those with little to no knowledge of the materials, it’s pretty good. Either way, I would recommend giving it a try. 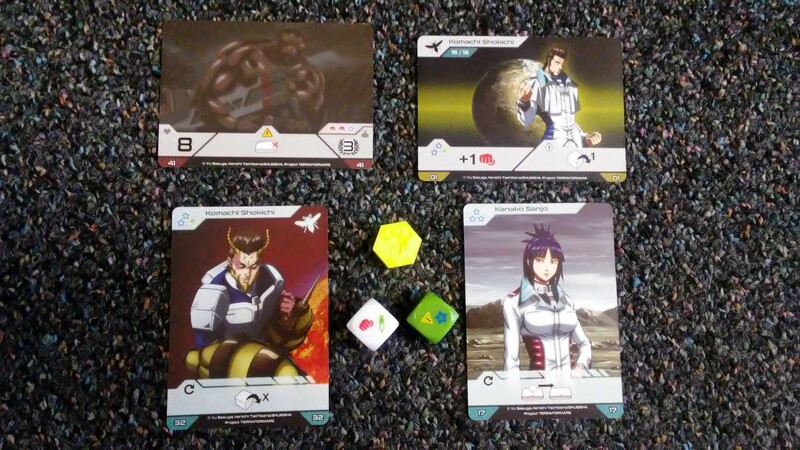 Terra Formars is a dice rolling game based on the original anime/manga series. It’s fairly quick to play. Most game sessions last about 30 minutes. The artwork on the cards look ripped right from the anime series. Many of the cards are quite gorgeous. The hero tokens are a bit odd and the dice seem like the symbols on them may wear off over time, but overall the game looks good. The rulebook is great. I’m especially thankful that the designers saw fit to include details for every card in the game including it’s reference number for ease of play. The game itself has a lot of deck building and dice rolling feeling to it. I don’t think that it completely hit the mark for the dark and grittiness of the series, as the game tends to feel more of a race to get the most points with little repercussions. I think that fans of the series may like this one. I think my lack of knowledge lead me to like it a bit more than I think I would have. Overall I like the game. I would recommend giving it a try. Of course you might want to grab a can of Raid first. Cockroaches…YUCK! This entry was posted in Reviews and tagged badoux, board, board games, card, card games, formars, games, japanime, japanime games, nicolas, Nicolas Badoux, terra, terra formars. Bookmark the permalink.